For six years in the nineties we lived in a little house on a hill on the west side of Los Angeles. We always bragged that while the house might be small, we had a million dollar view. On a clear day we could see the Hollywood sign from our backyard. The house was something of a gift. We inherited the place when the current tenants, our good friends Mike and Judy, found a house they wanted to buy and recommended us to the landlord. When they moved out, we moved in. We signed the lease that dropped us within the boundary lines for our school of choice, just days before the deadline to register for a coveted kindergarden spot in the fall. Our son spent his entire elementary school life in that little old house, going from kindergarden through fifth grade in the same house, going to the same school, with the same friends. I call it a little house because it was. Just 1050 square feet. Two bedrooms, one matchbox sized bathroom, a kitchen so tiny that there was little more to it than the stove/fridge/sink work triangle, certainly no room for a dishwasher. I was the dishwasher. On the plus side, a modest but airy dining area opened to the living room and lovely maple toned hardwood floors ‘flowed throughout’ as we realtors like to say. There was a wood-burning fireplace and well-placed windows to let the sun shine in. In the back, the den opened onto the backyard, a triangle of green. In one corner, in the big tree, my husband built a treehouse/platform affair complete with yellow plastic slide. In the other corner a ramshackle storage room so water-logged the only thing stored in there were mushrooms growing up through the floor. On the far right, the old wooden garage, overgrown with bougainvillea. In between, a low wall demarcated the property line, beyond that there was nothing but that million dollar view. In the front of the house, a good sized lawn was fronted by a split-rail fence and a flower bed where Mike had planted roses and Cosmos, pink flowers that grew so tall and abundantly, they threatened to overtake the yard. I pulled those pretty pink Cosmos from the ground one day early in our tenure and regretted it the entire time we lived there. Never, ever get rid of a pretty pink flower that flourishes in spite of your lack of a green thumb. Those Mar Vista years on the hill were good ones, full of happy days that would become Throwback Thursdays, Flashback Fridays, and Memorable Mondays—if that’s a thing. A couple of kids, a girl and a boy close to our son’s age, lived next door. Shy at first, they soon proved three can be company, good company. Their dad was a writer/director who worked from home when he wasn’t shooting, their mother was a big mucky muck for an international clothing company. Much more than their swanky job titles, they were great people with open hearts and an open door and between our two families, our kids always had our houses to run in and out of. Between us we went through countless plates of spaghetti, umpteen loaves of bread, cases of jars of peanut butter and an unknowable number of glasses of milk while the kids played together, creating imaginary worlds where they ruled and sometimes battled, had fights and made up. When he wasn’t hanging out with the neighbor besties, our boyo had his other friends, boys who came over after school to play video games—Spyro the Dragon, Crash Bandicoot, Mario Cart—and boys who came to battle. It’s amazing the destruction one nine year old boy can wreak with a plastic Darth Vader light saber. Don’t tell them I told you this but at five and six, seven and eight, the boys still sounded like girls, their screams and screeches bringing me rushing into the room to make sure no one was killing anyone more times than I can remember. Weekend sleepovers were a regular occurrence. Our only child always had one of the guys over to play, and often to stay. There were birthday sleepovers too, a dozen boys sprawled in sleeping bags on our hard living room floor. A choice of pancakes or Coco Puffs for breakfast as they gathered in waves around our dining room table with their scummy unbrushed teeth and bedhead hair, guzzling down the Tropicana orange juice, wiping their mouths on their pj sleeves, giggling about this one’s snoring and that one’s farting and rehashing the hilarity of the Zoolander dvd we’d rented at Blockbuster for the occasion. It was the house where we celebrated Halloween with fake tombstones and a witch nailed to the jacaranda tree in the front yard. The house where we held cub scout meetings, pledging allegiance to the flag, squeezed in next to the tv for the occasion. The house where we welcomed our beagle Charlie into our lives, a puppy who would help me feel safe while my husband was away on location. It was the house where we had a big birthday party for my mother in the backyard on a sunny July day. Her 70th, it would be one of the last she’d remember. We survived Y2K in that house and the realization that my mother had Alzheimer’s as she slipped further and further away from us. It was the house our son would go from age five to ten in, from a little boy on the first day of kindergarden to a culminating fifth grader, delivering one of the commencement speeches. And then we moved. The word on the street was that the owners’s kids were moving in. Or, we heard, the owners were thinking of selling, taking advantage of a housing market where they could get close to seven hundred and fifty thousand dollars for our cottage size house in a highly desirable westside neighborhood. We got out of Dodge, leaving L.A. for the suburbs, less expensive housing and an amazing school district. Over a dozen years later, I happened to be back in the neighborhood recently, running errands with my sister. You won’t be surprised to hear that Thomas Wolfe was right, you can’t go home again. I thought I was on the wrong block. There was my address but where was our house? I did a double take, a character in a sitcom. 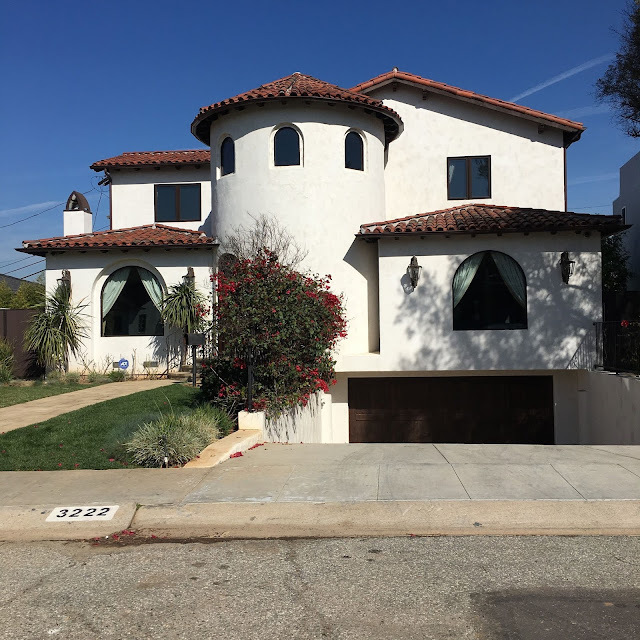 Our little single story house had morphed into a rambling two story Mediterranean style home. The garage? It was underneath the house. The jacaranda tree, gone. The flower bed, bull-dozered. Our tiny 1050 square foot house had grown into a 3800 square foot house with 3 bedrooms and four bathrooms. Plus a pool. And apparently a tower! According to Zillow our little house on the hill is now worth roughly $2,500,ooo. Two and a half million dollars. I wonder how the pancakes are.